The latest release of LAStools from rapidlasso GmbH contains a new toolbox for ERDAS IMAGINE®2014, allowing the users of Hexagon Geospatial’s powerful remote sensing software to utilize the popular rapidlasso LiDAR processing modules. The tools have been fully integrated into the software so that they are also available as operators within the IMAGINE Spatial Modeler framework. This new ERDAS IMAGINE 2014 toolbox is included in the latest version of the LAStools distribution. This release instantly augments the existing image analysis tools of ERDAS IMAGINE 2014 with the widely-popular point processing capabilities of LAStools. These new tools empower users to validate, quality-check, clean, classify, thin, raster, contour, and compress LiDAR pointclouds in LAS or LAZ formats as well as directly consume and further analyze the resulting raster or vector products with the rich functionality of ERDAS IMAGINE. 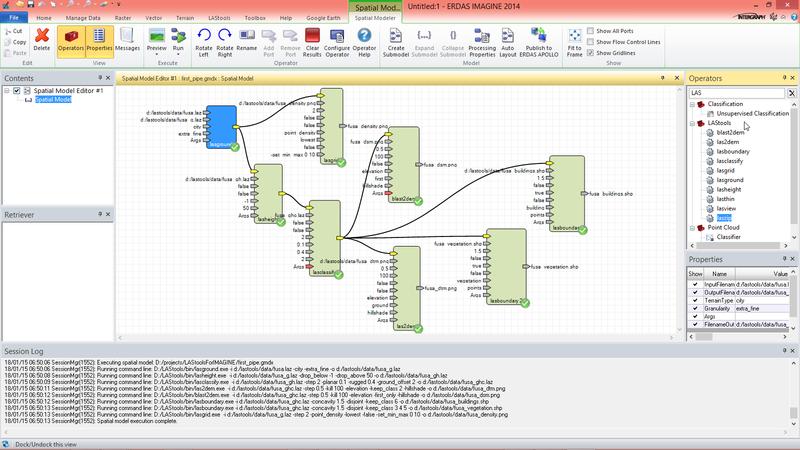 Sample LAStools workflow created with the Spatial Modeler of ERDAS IMAGINE.